Recently I was asked to read and review a new fitness book coming out this month. I jumped at the change because the topic was something I was highly interested in: weight loss and kettlebells. The book is called “The Swing! 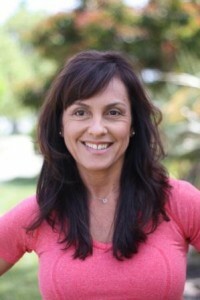 Lose the Fat and Get Fit with this Revolutionary Kettlebell Program” by Tracy Reifkind. The name might sound familiar to you if you read the book “The Four Hour Body” because she was one of the case studies in that book. Check out Tracy’s Facebook Page for more information. I’m not new to the kettlebell world. My boyfriend Michael has been talking about the workout for years due to it’s popularity in Mixed Martial Arts, and I’ve done a kettlebell workout at my old trainer’s crossfit gym. I loved the workout and have been anxious to do it again. My trepidation? I was worried about doing it on my own and having bad form. This book detailed many workouts and also went over proper form complete with pictures. Tracy’s story is similar to mine, which I could obviously relate to. She was in her forties and had been 250 pounds for most of her adult life. She had a wake-up call that told her it was finally time to lose the weight, and she did. I think no matter how much weight you want to lose–10 pounds or 100– you can find value in this book. What I didn’t agree with in the book was her statement that gyms were a waste of time and that you won’t lose weight working out at a gym. I beg to differ. As someone who DID lose over 100 pounds by swimming and working out in a gym, I think gyms can be beneficial. The good thing about gyms is that there is variety. Too often people get bored with working out and then give up. There are so many different classes and machines at the gym that it would be impossible to be bored. But to be fair, not everyone likes the gym environment. My boyfriend, for example, hates gyms and works out at home (including a kettlebell workout). Yes! I’ve said it many times. The weight loss equation is diet and exercise. They go hand-in-hand with losing weight and keeping it off. Ignoring one part of the equation will slow the process down and the results will be disappointing. I’m really glad she addressed this fact because it’s all too common when people try to lose weight. They often think it’s a temporary thing, it’s a diet, that they can restrict calories and exercise for awhile to lose and then go back to their bad habits. That’s how we “yo-yo” diet and it’s not lasting results, nor healthy. There were two things that turned me off in the book: the first was that she wrote as if everything was fact, but it was lacking in annotations citing sources (which I like to see) and the frequent use of words like “rapid weight loss” felt gimmicky when it’s not; I felt like that diminished the amazing benefits of the kettlebell workouts. What is great about kettlebell workouts is that is both cardio and strength training in one. What an amazing way to get aerobic and anaerobic fitness in one session! 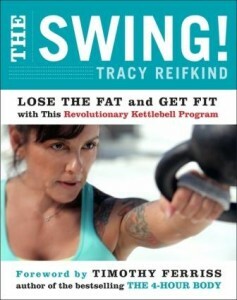 Reifkind also stated that kettlebells were how she managed to lose 120 pounds and avoid sagging skin [pg 64]. Except for swimming, of course! To each its own. I do a lot of different workouts because I like them. I swim, I bike, I run, I hike, I walk, I lift weights. I think there is value in doing all of them. The book spends a decent amount of time on listing a bunch of different workouts to do with the kettlebells, as well as addressing the food part. I will let the readers draw their own conclusions on her food plans. The book is valuable for kettlebell newbies and I’m looking forward to starting the workouts from the book. 1. Leave a comment here telling me your experience with kettlebells. 2. Become a member of my Facebook page and leave a comment here telling me you did. 3. Tweet this: “I want to win a copy of the book The Swing! from @lisaeirene at http://wp.me/p116Lc-7WW” and leave a comment here telling me you did. I will pick one person to receive a copy of the book this Sunday, April 22nd. You must have a mailing address in the United States or Canada. Thanks! QUESTION: Have you done kettlebell workouts? What did you think? I have never used Kettle balls, but am very interested! We cannot afford to be part of a gym right now, so an effective workout at home would be great! Yes, kettlebells are a great alternative to a gym membership if you can’t spare a monthly fee. I don’t have any experience with kettlebells, but I would love to read the book and start. I’ve never used kettlebells, but I’d love to try it. I have never used kettleballs but would love to try them. I NEEDED the gym to lose my weight. I can’t stay disciplined enough at home. Thanks for sharing your review of the book! I’m with you. I need a PLACE to go to! I’ve never done them because I always worry about the swinging motions and my back. But I’ve read research from the ACSM that shows how incredibly effective they are. I have never used kettlebells but would love to give it a try. ps – thanks to you, I am starting week 2 of a running program. You are an inspiration. I’ve never done a full just kettle ball workout. However I have used them as part of circuit stations in group fitness classes and I’ve found I quite enjoy them. The swing motion I get with them doesn’t seem to bother my back as much as when I use dumbbells for the same movement. I think the key is to maintain proper form and the kettle balls help with that. I also find them so much nicer to hold and handle versus dumbbells and medicine balls! Crystal recently posted..For the second spin class…. Yes! They are definitely more comfortable to hold. I enjoyed using them quite a bit. This type of workout is totally new to me but it sounds like something I could do! I’m glad you enjoyed the book overall in spite of the minor quibbles you had with it. Thanks for being on the tour!